Full disclosure: I think well-written time travel novels are few and far between. I expect a level of explanation and detail that makes it hard to impress me. That said, The Here and Now wasn’t too bad. There were some small things I wish had more explanation or more depth, but overall, it was good and enjoyable. Prenna is part of a select group of people who travel from the year 2098 to 2010 because of a plague transmitted by mosquitoes. Ethan becomes her friend, a couple years later, and she finds herself questioning the rules of the community and the tight restrictions they have placed upon everyone who travelled. When a homeless man tells her there’s more she needs to do, it sets off the story of two kids working to change the future as they realize the depth of their feelings towards each other. Prenna has some strengths as a character, but also falls a little flat at times. She starts out as a confused girl, unsure of her place in the world. She follows the rules, but she questions them. Some makes sense, but others leave her wondering. Ethan, a boy at her school, has become her friend. She finds herself enjoying the time they spend together. This only confuses her more. She’s not supposed to have “intimate” relationships with the native people. But she blurs the lines between friends and more at times. However, as the book progressed, I felt that instead of gaining strength, she was stagnant. There was a moment at the end that I cheered for her, though. Ethan is a little hot and cold for me. There’s moments when he’s really sweet and kind, then a few pages later he’s a little clueless. He’s still sweet, but I was occasionally left wondering how he was supposed to be the one to help Prenna with her mission. That being said, their relationship was a sweet, first love kind of thing. It didn’t try to be more. It was refreshing to read a book with a relationship like that. The plot itself is so-so to me. The idea is interested, but things just seemed to be pulled together a little disjointedly and occasionally lacked explanation. Things would happen and the characters would point out the logic, but I’d be left confused and thinking that there was no logic involved. The time travel aspect was handled well, but I just wish there had been more attention to detail. 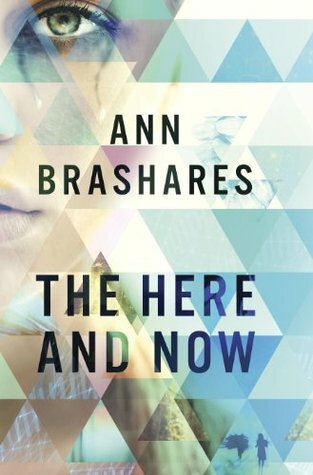 The Here and Now is a young adult book that attempts to tie time travel, love, and high stakes together. It doesn’t fall apart, but it could have been so much more. It was a nice read, but nothing spectacular. It wasn’t the “epic romantic thriller” described in the synopsis, but it was good. Thank you to NetGalley and Random House Childrens for an advanced copy of the novel in exchange for an honest review. This entry was posted in Contemporary, Something a Little Different, Young (and New) Adult and tagged Ann Brashares, Contemporary, Science Fiction, Young Adult.